Place 2 naan breads on a baking sheet topped with parchment paper. 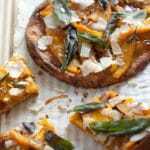 Layer pumpkin pieces on naan and drizzle with ¼ of the reserved olive oil. Bake for 5 minutes at 400 degrees or until naan and pumpkin is warmed through. Remove from oven, brush with chipotle honey and top with ¼ of shaved parmesan cheese, crispy sage leaves and sprinkle with additional kosher salt. Repeat with additional naan breads.